I posted a while back about my love for Palmolive's Damask Rose & Musk Hand Soap that came in the lovely vintage shaped bottle and had the most subtle, beautiful rose scent, I ran out of it recently (I bought a huge stash of it when I originally found it but it's all gone!) and was quite devastated not to be able to find it anywhere, what I did find though was two of the other soaps that were in the same range, The first I'm going to talk about is the Bergamot & Verbena soap but they also do a Lavender & Chamomile one that I will post about soon. So, the Bergamot & Verbena comes in the same lovely shaped bottle, definitely a vintage feel and has a pretty floral patter on the front. This particular one is a green liquid, which probably isn't my favourite colour for soap but it's not too bad and the prettiness of the bottle makes up for it, my brother was actually the one that picked this one out, and I guess it's got a slightly masculine scent, but very fresh and herbal smelling as well, and there's a hint of floral scent in there as well, Initially I wasn't keen but once you use it, it's actually lovely and lingers nicely on the skin after use. It's not a massively moisturising formula but it's also not drying at all either and leaves hands feeling super clean. You can also pick these up in a bar format and also as shower gels and again, they come in beautiful packaging with a vintage feel, these are all part of the Authentics (Savonniers since 1898) range that link back to the original glory days. I picked mine up in Wilkinsons for a bargainous £1 each - but they usually retail at £1.99. 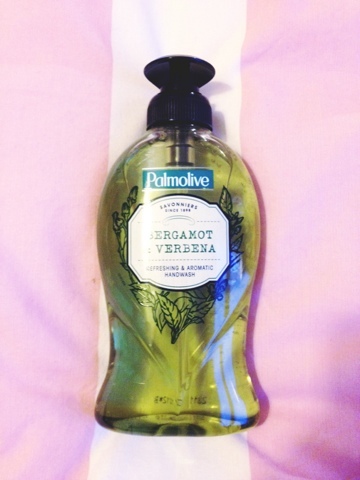 2 comments on "Palmolive Bergamot & Verbena Hand Soap"